Scouts seemed particularly chipper as we woke on Friday morning. It's probably because the end of a long week was in view and they were ready to go home and sleep in their own beds. We enjoyed biscuits and gravy along with scrambled eggs, cereal, etc. for breakfast. Then, everyone continued with their routine of attending their classes for the last time. 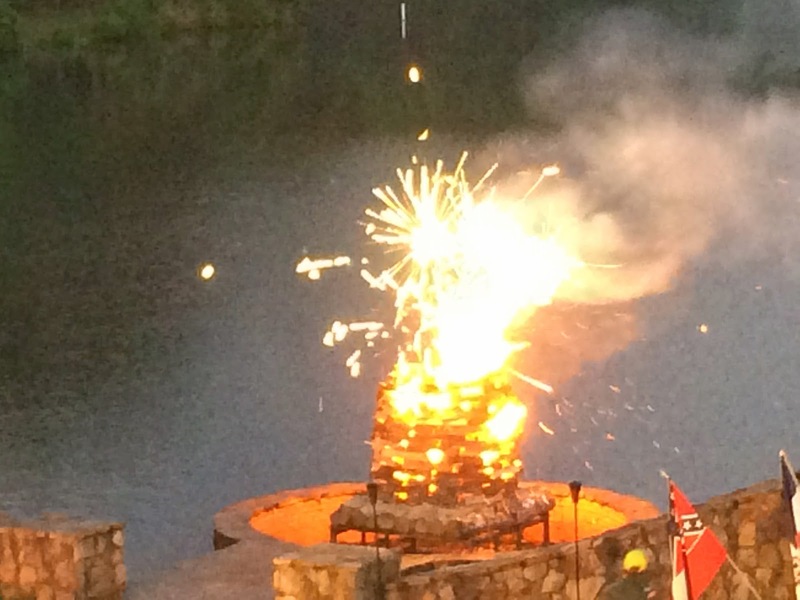 The first-year scouts finished up at Mountain Man and went through a graduation ceremony. These Scouts did an excellent job all week of attending Mountain Man classes and earning those very important requirements for their initial Scout ranks. 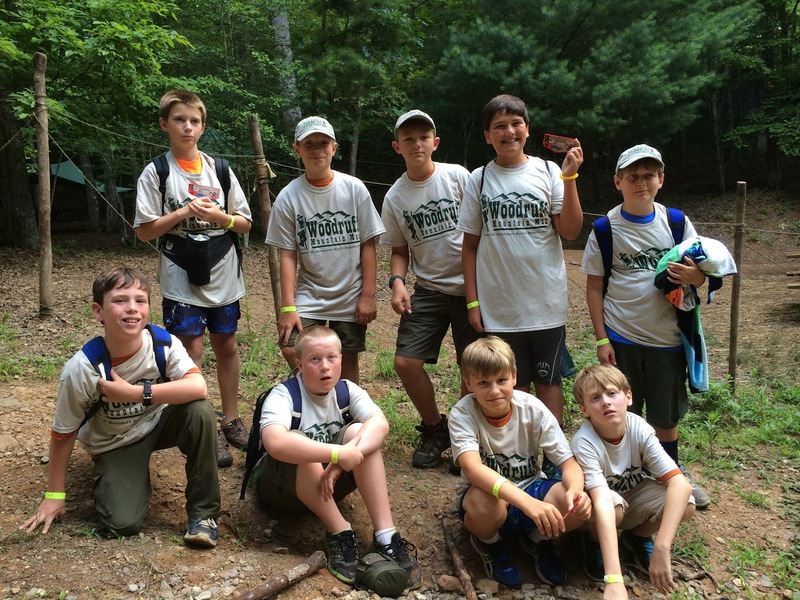 Those skills will be put to the test this fall as they become more acclimated camping with us as a troop. After classes ended in the morning, we met up for lunch and enjoyed corn dogs, chips, corn, and peaches. We had some free time after lunch before making way to the activity field for the camp-wide game. This took much coercion from the leaders to get the Scouts on board to try the activity, which we found out was rubber chicken volleyball. 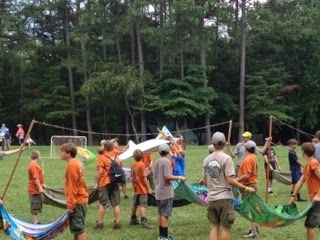 Once the Scouts gave it a try, they embraced participating, and several of us were quite good at it. We ended up a disappointing 1-2 run in the tournament, but won in the long run because it was an activity we enjoyed. This might appear at a later campout or troop event. Using a towel and a partner to sling a rubber chicken over the rope! While we were competing for the rubber chicken trophy, Assistant Scoutmaster JP Pendleton went to shoot in the Scoutmaster Shoot at the rifle range. He only required a few shots to earn a "dime." 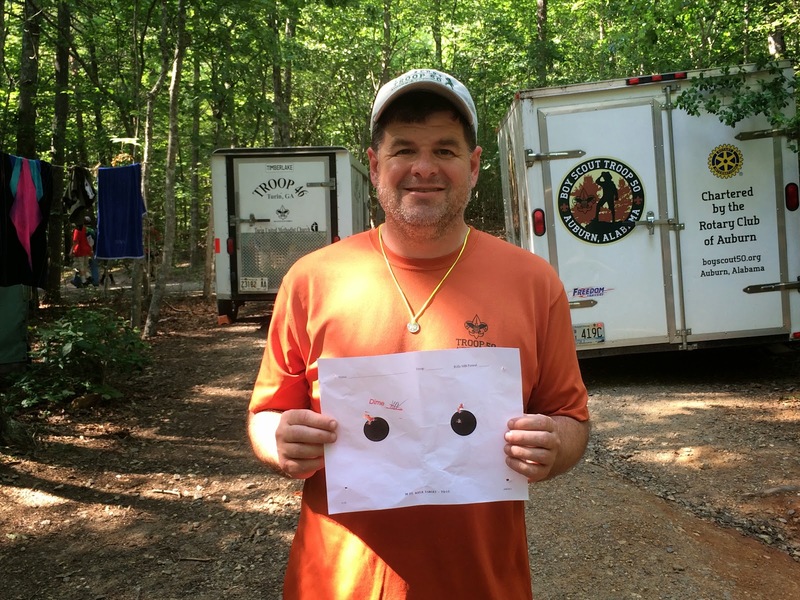 This means that five of his shots are close enough to each other that a dime would cover up the holes in the target. Nice shootin', JP! Thanks for representing our troop well at the range. Sharp shooter, Mr. Pendleton with his "dime"! After the tournament, we had some additional free time before dinner and many started packing or hit the snack bar at the trading post one more time. For dinner, we ate outside at a picnic table and enjoyed a barbecue sandwich with chips, coleslaw, and apple cobbler. Many Scouts enjoyed this meal the most. It was excellent. After dinner, we had a quick meeting to discuss the final logistics for our remaining time at camp and we watched a bit of Ultimate Frisbee between Troop 101 and the camp staff. Both teams were very talented. The evening concluded with the closing campfire, which included entertainment such as skits and the opportunity for folks to be recognized for their camp accomplishments. All three leaders on the trip — Assistant Scoutmaster JP Pendleton, Troop Committee Chair Rob Stanford, and Assistant Scoutmaster Wes Williams — earned the Scoutmaster Merit Badge for being active at camp. This took a bit of work and was well deserved by all. In addition, the troop received recognition from the camp as an Honor Troop, which includes another ribbon for our troop flag. This Honor Troop distinction simply meant that we were active at camp, followed the rules, and went a little above what was expected of us — including several of our Scouts participating in a camp-wide scavenger hunt. Way to go, Troop 50 Scouts! After the campfire, we all headed back to camp to pack up. The goal was to have everything that we didn't need packed up so we could leave early in the morning. The Scouts all took showers, packed up their gear, and headed to bed. The end of a great week is very near and we have traveled a long road. The Scouts had a great time and it will be nice to wrap up the trip home safely and timely. For more Day Six pictures, be sure to see our online photo album.